As a general rule, I rarely reread. Perhaps that's partly because I'm a blogger, with a massive to-be-read pile and stack of review copies to get through, or maybe it's because I'm worried I won't enjoy the book as much the second time round. However, that's not to say there aren't certain books that I have reread many times (see above). So, what makes a book reread worthy for me? I've lost count of the number of times I've reread Harry Potter. And this is mainly because every time I reread one book in the series, I HAVE to reread the others. Plus, I reread the entire series countless times in the run up to Harry Potter and the Deathly Hallows. As for The Knife of Never Letting Go I read this back when it was first published and so ended up rereading it a couple of times (before each new book in the trilogy was released). Generally, I find myself rereading classics a couple of times. This is not because I think that ALL classics are perfect, but because on the first read I'm too wrapped up in the plot to notice the symbolism and different themes etc. Do you reread books often? If so, why? And if not, why not? 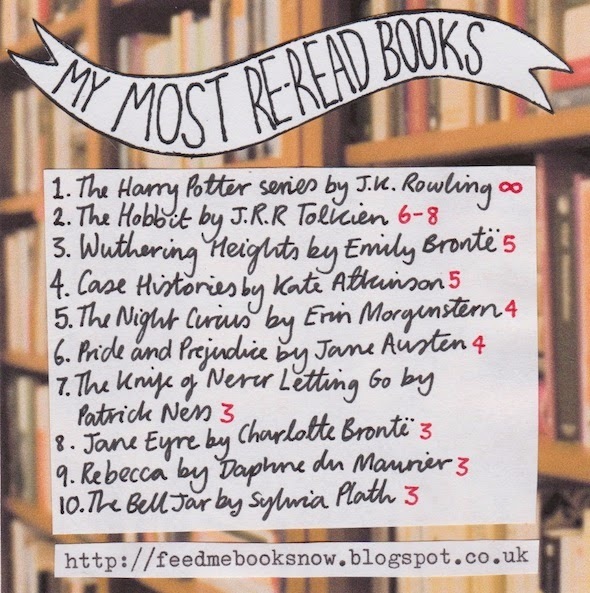 And which books are your most reread books? (I'm guessing Harry Potter for most). I love the infinity sign next to Harry Potter :) Makes me feel all warm and fuzzy. As for the Hobbit, Wuthering Heights, The Night Circus (which by the way I'm currently suffering a hangover from and don't know how to get over), all of Austen's books really and Jane Eyre - who doesn't like to keep re-reading them??? I'm someone who doesn't often re-read books for quite a while after the last time I've read them. I re-read The Fault in Our Stars recently just so it was fresh in my mind before the film, and as much as I'm a Potterhead, I'm not going to re-read Harry Potter again for a while given that it took me such a long time to read the books. Love the use of infinity next to Harry Potter. - Ruby, you genius. Great books! I've read the Harry Potter books so many times already. I also loved the Bell Jar, such a beautiful and sad story! The Bell Jar is simply gorgeous! Same with Harry Potter. My infinity sign would be by The Percy Jackson series and Harry Potter. Another series I'm not quite sure about would be the Magic Tree House books because (when I last read them) there were about 40 books and I read almost all of them and kept on rereading my favorites. I don't like rereading classics because I usually have to trudge through them- *imagine Allies landing on Normandy*. I only reread my absolute favorite books. I personally best enjoy rereading my favorite scenes, while even reading a book, the first time, will just keep on going back and reading it. Ruby, dear, why are you so good with photos of blog ideas? I LOVED Percy Jackson when I was younger – such a good series! I also reread my favourite scenes (I've reread scenes from The Bone Season SO many times). And thanks aha! Yes, I SO need to reread Crown of Midnight! I only reread if I'm one, in a slump, two, need a comfort read and, three, have a sudden need to reread a certain book again. c] If a book in a series is coming out and I want to refresh my memory of what happened or just because I love the book and I have a sudden urge to re-read it. Basically if I'm in the mood for Harry Potter. Always. Haha I think I reread The Hunger Games trilogy too (before the first film came out)! I don't reread too many books, but probably my most re-read book is Island of the Blue Dolphins by Scott O'Dell. That one was a childhood favorite that I like to go back to once in a while. :) I've also reread The Darkangel Trilogy by Meredith Ann Pierce quite a few times. I think the most re-read books seem to be ones from childhood! Apart from that, I re-read books a lot when I was younger - my Enid Blighton books were literally falling apart from being read so much - but now I don't. The only books I can think of that I've read more than once are How I Live Now by Meg Rosoff and the first few Narnia books (I read them when I was younger without finishing the series, and then went back to them last Christmas and read them all). However. I guess that's because, with some exceptions (HARRY POTTER), most of my favourite books are ones I've read in my teenage years so I've not had long enough yet before re-reading favourites. I have decided to start a fantasy re-read every Christmas though - 2012 was Narnia, last year was HP, and this Christmas shall be the Icemark and Inkheart trilogies. I am already excited! I try to wait until a series is over and binge-read it, but if I'm reading as it's published, I do re-read the previous books as each new one comes out. But I also re-read other books just because, though I don't do it as much as I used to. I stumbled across Goodreads about five years ago... before that, I spent most of my time re-reading just because I didn't know where to turn to find new books. Obviously I don't have that problem anymore, but I still try to make time to re-read. Yes, that's so true! Before I discovered Goodreads, I was so behind with new releases that did A LOT of re-reading! I grew up with HP, so that's why I've re-read it so many times!